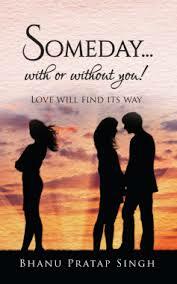 Someday.. from the cover and the blurb looks like to be a usual love story , perhaps a love triangle too. But fortunately this one is bit more than that. The book opens in a parallel track of two different people , in different years narrating their version of events. There is an obvious overlap but for most part , the story moves on its own pace and hooking the reader to this heady mix of past , present and the characters in the book. The book is almost an accurate version of relationships , tangled emotions and messed up ego of the current generation. You will see a part of some one known in the characters described , without judgement of course. The story has some loopholes , a little too much cheesiness at times but perhaps I have heard equally weird tales in reality so I could accept certain events as it is and move on. I do have a certain disregard for the kisses and making out scenes but only once did I feel the scene was out of flow. Rest of the story is pretty engaging and quite believable in its premise. What totally made this book a worthy read was the point where the past and present overlap and we see Dave go back to face his past , the consequences of his one mistake in order to sort out his present love story. There the things get too interesting for me. That is when I actually smiled and gave an imaginary thumbs up to the author for this story. The book has its own flaws , it is not too refined at places and seem like any other indian fiction we come across. But it has the potential to make you forgive those flaws by the time you finish the book. Do give this one a try. You will not regret reading this.